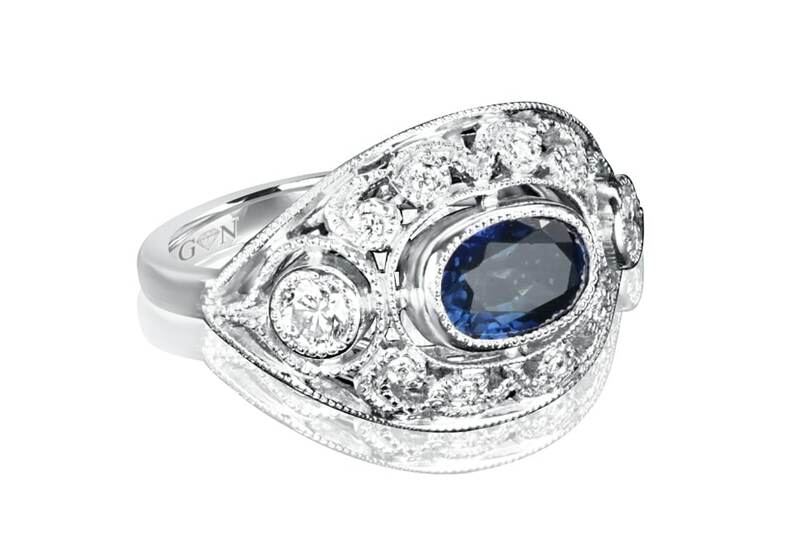 At GN Designer Jewellers in Melbourne, we specialise in custom made engagement rings and custom wedding rings. You will deal directly with a custom ring maker and experience our friendly service and exquisite artistry. Before visiting our showroom, we encourage you to browse our image gallery for an extensive range of beautiful custom made rings. GN Designer Jewellers only uses ethically sourced diamonds, and our ring makers are bound by the strict code of ethics outlined by the Jewellers Association and the Goldsmiths Guild. Our team of experts at GN Designer Jewellers in Melbourne can support you in designing your very own custom engagement ring. A custom ring maker will incorporate any imagery, ideas or inspiration you bring with you to your design consultation. GN Designer Jewellers are expert designers and custom ring makers. You can choose from our range of high-quality coloured gemstones or beautiful loose diamonds, and we offer a large selection of ring styles to try on in our Melbourne studio. Our ring makers will ensure that your experience is informative, relaxed and enjoyable. You can experience our exceptional and personalised service from a custom ring maker at GN Designer Jewellers. We will construct your custom made engagement ring in our Melbourne workshop based on your designs, and all our custom made rings come with a lifetime guarantee. If you are uncertain of the style of ring your partner wants to wear, you have the option of proposing with a loose diamond or gemstone then returning to complete the custom engagement ring design together. At GN Designer Jewellers in Melbourne, our ring makers focus on awe-inspiring custom made rings. You can expect exceptional service and extraordinary artistry when you deal directly with a private jeweller and custom ring maker in our Melbourne store, where we have a stunning studio, workshop, and showroom. Though if you wish, before visiting, you may want to browse our extensive gallery of beautiful ring designs to inspire you. You can contact us anytime with questions and speak directly with an expert. GN Designer Jewellers are proud to present handcrafted pieces of jewellery and custom wedding rings that adhere to strict standards of jewellery making. We have of a vast array of diamonds and gemstones that have all been certified by the Hoge Raad voor Diamant, also known as the Diamond High Council, or more commonly the HRD, the Gemological Institute of America (GIA), and Auscert. The team of professional jewellers at GN Designer Jewellers in Melbourne can help you in designing your very own bespoke custom made engagement ring. We will incorporate any ideas, imagery or other design thoughts you bring with you to your no-obligation design appointment. Our ring makers will offer expert design advice and create something truly unique that captures your vision. We have experts to assist you in finding the perfect stone and cut for your situation and budget. Choosing an engagement ring or designing custom wedding rings is an exciting venture, and we will endeavour to make this process enjoyable and stress-free. We will impart our knowledge and answer any questions so that you can focus on your next big question. At GN Designer Jewellers deal directly with a personal jeweller along your quest to acquire the perfect custom engagement ring, a ring that will be handcrafted right here in our Melbourne studio, and our custom made ringscome with a lifetime guarantee. If you are planning a proposal and looking to buy a custom engagement ring for your partner, you may wish to come and speak with one of our expert ring makers. Style, size and stone are all crucial factors and a custom ring maker will be on hand to guide you through. You may already be sure what you’re after, though if you are not, our friendly staff will be more than happy to help you make the right choice. Sizing can be challenging if you are planning a surprise proposal, but we have a few tricks for that. With only a small amount of information, our ring makers can deduce the right size. Style, of course, is a matter of taste – you may wish to pay close attention to any hints given, or jewellery already worn. Our expert ring makers can direct you so you can propose with a perfect custom engagement ring. You do also have the option of just choosing the right stone, proposing with that, and returning with your fiancé to complete the design process together. All our engagement rings are custom made; this means that any layout is attainable. You can choose from our extensive range in store or work directly with a custom ring maker to bring your design to life. We have many rings displayed in our photo gallery so you can decide your preferences of stone and steel. Having a custom made engagement ring guarantees that you will end up with exactly the design you want, and it offers you the possibility to create something unique that perfectly suits your style. For custom rings, we recommend starting with choosing a diamond or coloured gemstone from our wide selection. Following that, a custom ring maker can then guide you in designing the perfect layout for your custom made engagement ring. To help you choose your design, we have a huge variety of engagement rings on display so you can gather inspiration and see first-hand what style will fit their hand. You can pick one of our many stunning designs, or you could combine a layout utilising various factors from those displayed. Alternatively, you could bring your thoughts or photos, and a custom ring maker can create sketches of numerous layout options. If you already have a gemstone or diamonds that you wish to use, a ring maker can create a custom made engagement ring or custom wedding rings using that stone. You may have an antique or heirloom ring that you want to be remodelled, and our ring makers will be happy to repurpose a meaningful stone into something new. With over 20 years of experience in crafting bespoke engagement rings, custom wedding rings, earrings, pendants and a lot more, GN Designer Jewellers will find the right ring for you. Whether you’re after white gold, rose gold or platinum, diamonds or sapphires we will ensure you leave the store with a ring that was created to symbolise your love. A key a part of the design process at GN Designer Jewellers is collaboration. Working together to couple your passion with our experience, and create a unique piece that says everything you wish. An engagement ring may be a large purchase, though you can get excellent quality for your money, and we cater to all budgets. Our jewellers will endeavour to get you the very best bling for your buck. Our rings last a lifetime, and we provide professional cleaning and maintenance services so you can rest assured that custom rings from us will shine for a lifetime. For more information about custom made engagement rings in Melbourne, you can contact us on (03) 9602 2153, or stop by our store located at 62 Hardware Lane, VIC Melbourne Australia.